Tonight President Trump will give his State of the Union address, the annual speech about the president’s goals and agenda. Today I have a work meeting about management practices. So when I read this piece yesterday by Axios on Trump’s schedule (from a leak of November and December dates), I figured what better piece to highlight here on Coffeespoons. To be fair, the concept is pretty straightforward. We have a stacked bar chart with each type of time block represented by a colour. Because the focus of the piece is the Executive Time blocks, I really think the designer did a great job summing the other types of time, e.g. travel and meetings, into one bin. And by being a lighter colour on nearly the same scale as the grey, it helps the orange Executive Time pop. 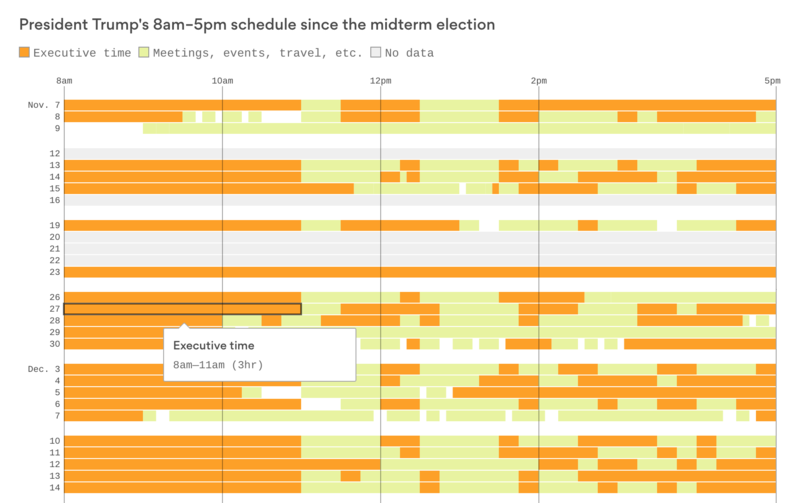 Clearly Executive Time dominates the schedule, which as many analysts have been pointing out, is a departure from recent past presidents. And, if you’re curious how the time blocks compare, elsewhere in the piece is a stacked bar chart summing all the types of time. Not surprisingly, most of his schedule is Executive Time.